With recurring affiliate programs, you get paid repeated commissions for each and every sale. … Where you can make up to $219 per month for each customer with the programs listed below… + proof of payment for doubter. No product creation. So, it is one of the best legit residual income online opportunity you can count on. 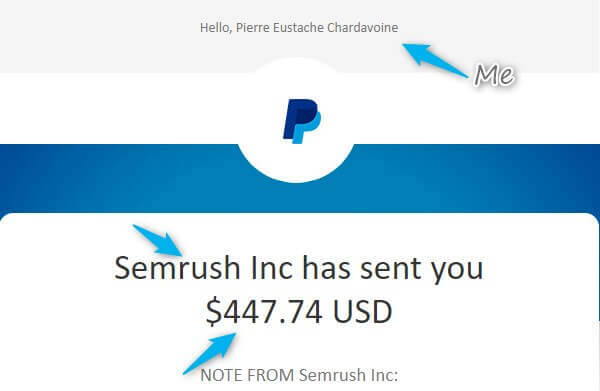 In today’s post, I will give you a list of legit programs that pays recurring affiliate commissions. I promote and get paid from most of them. Hope you’ll find the programs your audience needs. Some programs pay repeated commissions per sale for one year. Some keep paying for the lifetime of referred customers’ membership. Once you refer someone and he’s active, you keep making money every month. They pay either via PayPal, Direct Transfer, Payoneer, Western Union or Skrill. You can get paid at your convenience. And to help you, I talk about payment method for each program. Depending on what you promote, you can get paid from affiliate programs that pay daily, weekly or monthly. To clear some minds, I’ll start first by talking about what residual affiliate programs are and why they pay repeated commissions. But if you want, you can just jump right to the residual affiliate programs list. 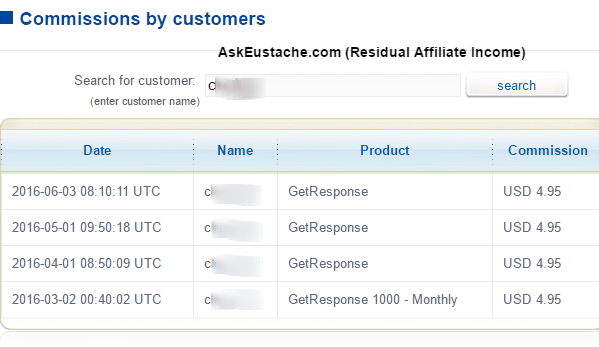 What are recurring affiliate programs? Why Should you promote them? Like any affiliate program, you get a share from sales resulting from your promotion. But, Residual income affiliate means that you get repeated commissions per sale. I’ll take SemRush to illustrate (it’s a real residual income opportunity). You refer Joe to SemRush SEM/SEO tools and he buys a membership plan for $99.95. Each month, he pays for the plan and you get paid a percentage without further work. Outcome for you: You make $39.98 each month. And the company gets a loyal customer. Benefits For Joe: he pays for the awesome services that solve a big SEO problem. He’s happy you referred him to that platform. Outcome for the company: More income because you’re bringing more customer and promote their product more than products with flat rate commissions. It’s that simple. No trick involved. If you refer Joe, Peter and James. It’s $39.98 X 3 = $119.94 per month. You refer more people, you earn more money. How to Find Topic To Blog About? List of the top affiliate programs for bloggers. How to write blog posts that get traffic and converts into affiliate sales? Why should you promote recurring income programs? With flat commission affiliate programs, you keep working hard. With residual income affiliate, you don’t have to worry about mandatory work to make consistent money. As example: with one-time payment, if you earned $2000 the last month(the link leads to a $2000 affiliate commission per sale story), and it is all spent, you have to work hard to earn that again. But there’s no guarantee if will happen again! With residual revenue, you earn that $2000 without additional efforts. You can just increase the earning with more work. You work smarter then. You can expect monthly, weekly, or daily payment. Your past work keeps making you money. A referred customer who stays active is a customer that is happy. Make sure you promote only highly reputed affiliate programs if you go beyond that list. To earn huge money through recurring income affiliate programs, you need to promote the best kind of products. The programs giving repeated payments are programs where recurring fees are charged to referred members; Or where referred members keep earning revenue day after day, month after month. So, they are mostly membership sites, services based, or money making sites. I’ll list recurring revenue affiliate programs by category. The description for each item will help you make wiser choices. Keep in mind that this is not a complete list. But it’s perfect, with enough programs, to earn a living if you can convey the message to convince your readers to buy. They work within several niches. Web hosting companies allow you to promote their services and earn revenue. You earn flat rate or recurring payment according to plan purchased by your referred member. Some web hosting programs allow you to create your own coupon codes to get more customers. Enjoy the list of reputed web hosting companies where you can quietly refer your friends. You’ll also earn recurring money the lifetime of membership. It is one of the best hosting sites for managed WordPress, VPS, Cloud and dedicated servers. It has no limitations on traffic when you use them; unlike most web hosting services. It has the latest technologies and make hosted sites fast. It has excellent support team. On top of that, it is among the rare high paying web hosting affiliate programs that give residual commissions. You earn up to $1500 flat commission per sale + 5% lifetime residual income. It’s up to $1500 once + up to $56.35 per month per customer. An awesome income opportunity considering you’re sending your readers to a trusted program. Their program is listed on networks that pay via PayPal, ACH or cheque. …the affiliate sign up link is at the site bottom. Their plans start at $10/month for 1TB bandwidth and 25GB storage. The best part: you can start a free 3 days trial. get paid flat commission per sale ( $50 to $125 per sale) based on number of referrals you make each month. get paid $30 flat commission per sale + 7% residual commissions per month for the lifetime of the customer membership. You just email your affiliate account rep if you want to switch structure. The minimum payout is $250 via PayPal. Learn more about CloudWays + Start your free 3 days trial. This host offers Managed WordPress hosting (starting at $15 per month), business hosting (starting at $3.00 per month), dedicated servers (starting at $85/month). Get paid 35% recurring signing up through their managed affiliate program. SemRush is a SEO tools you can use to gather keywords, spy on competition and optimize site ranking. It has a free plan you can try today to test its effectiveness. Earn 40% recurring commissions promoting the pro plans as an affiliate. You earn $39.98 per month for pro plan, $59.98 per month for guru plan, $219 per month for a business plan. Imagine you referring 3 pro accounts, 1 guru account, and 1 business one. It’s $398,92 per month for 5 referrals. But it’s all theory for now. Go make it a reality. Like the example I took above, I earn minimum $39.98 per month per customer. They pay each 15 days via PayPal if you have more than $50; via wire if you have more than $1000 in your account balance. This is another awesome keyword tool to find profitable keywords. It helps marketers discover long tail keywords, see how profitable and how difficult it is to rank for those keywords. It is one of the cheapest but robust keyword research tools. You can test it for 10 days for $1. Then if you like it, plans start at $25 per month. As an affiliate, you get paid 30% recurring commission promoting LTP. The affiliate program is hosted on Clickbank which pay through cheque, PayPal, and ACH when you reach $10 in your account balance. sell digital downloads online using Stripe payment processor. As an affiliate, you earn 30% lifetime residual commission per referral. The commission per customer goes up to $59.7 per month. They have an in-house affiliate program where you get paid via PayPal. They are listed on ImpactRadius too. … Join as an affiliate. Get 30% of the best email marketing service called MailerLite. You help your friends to find a cheap but powerful email service provider. And you earn residual income as an affiliate. This is the email service that I use and it is free for up to 1000 subscribers. All the plans, even the free one, have unlimited email sending and automated email sequences. Collect emails with ThriveLeads. The list-building tool from ThriveThemes is one of the most effective I’ve used. It is a one-time payment for awesome features such precise targeting, smart trigger to display exit forms, advanced reporting and A/B tests. But ThriveThemes has a subscription plan where you can get all the tools for as low as $9.99 per month. As an affiliate, you get 50% upfront + 25% residual commissions on all future referral charges. Get 33% from that email marketing and landing page software. Reputed and used by popular sites like Technorati and CNN. It has even more attractive features such as autoresponder sent when user take action on a particular email, have a certain subscription age, etc. It is a tested and proudly recommended online service for email marketing. You can Start now and get first month free. (No credit card or PayPal link required). They pay through cheque and PayPal when you reach $50 in earning each month. I have active referrals using that programs. You can join the affiliate program from the menu on their pages. Earn 30% recurring income from Aweber affiliate program. All plans include unlimited emails and start at $9 ( one-month free trial ). It integrates WordPress site and Optin Monster very well. It is the email marketing software if you want more automation for less money. You pay once for each subscriber independently of how many lists she is subscribed to. You can send emails to people who opened a specific email, followed a specific link, all on autopilot. It is great for those you sell online courses, especially email courses. They have no trial plan. Their entry plan starts at $29 per 1000 subscribers. They pay 30% residual income to affiliate the lifetime of the referred customer. Their affiliate program is hosted by GetAmbassador . The minimum payout is $100 via PayPal. This e-commerce software allows you to sell online and at local store. It supports fully functional e-commerce sites or just shopping cart to your existing website. Up to 70 payment gateways included and SEO optimized. Get paid 20% of each bill from your referred merchants as Shopify partner. You earn up to $2000 per sale with shopify affiliate program. I got paid both the lowest ($5.20) and the highest commission ($2000). Screenshot in the article linked recently. The affiliate program of Volusion pay 200% per sale up to $2000. But their reseller program allows you to earn 35% residual income. Just choose the plan that fit your need and start your store… Or as an affiliate, help someone find a plan tat fit their needs. Get 25% monthly affiliate commissions during the lifetime membership of your any merchant you refer. AShop allows merchants to start an online store easily. It integrates 9 ways to receive money, includes beautiful templates. It is fully customize-able and includes tools to increase sales and take data-driven actions. As an affiliate, you earn $6.25 to $62.25 per month per customer. Teachable is one of the best platform to sell courses online and make money from your skills. It has ready payment processors so you can start right away. You can host unlimited courses for free. When you promote Teachable as an affiliate, you earn 30% of paid plan for the lifetime of your referred teacher. You get paid via PayPal. Sign up for their free webinar. Social network is one of the most active daily tasks. It is used every day by all kind of users. Marketer uses it to promote products and build relationships; end users connect with friends and have fun. They are so popular that everyone needs tools to manage their social media accounts. So, special programs were developed where you can earn recurring revenue for referring users. This is the best Pinterest scheduling tool I’ve tried. You can use it to schedule, track and improve your pins. Save time with it and get more blog traffic from Pinterest. You can start for free and send your first 100 pins. As an affiliate, make 15% recurring and $0.20 per free trial with TailWind. The affiliate program is hosted on ShareASale which pay via ACH. You can start an account for free with TubeBuddy. It helps you boost your video ranking on YouTube and get more video views. It has premium plans too. And you get paid 50% residual commission for life. They pay via PayPal. It is a 40% recurring revenue affiliate program. It act as a social tool to schedule posts, get social insights, and monitoring multiple accounts in one dashboard. It has a free plan you can test today; and it supports LinkedIn, twitter, Facebook and RSS. 15% recurring income for 12 months. Collect information, create content, publish anywhere. Forget it, then , track and measure. This service allows site owners to add a Q/A section on their website. Do you remember how often you searched for a question online and found forums or Q/A sites as results? The service makes it possible that it is anyone’s website the next time. Their affiliates program pay 15% lifetime recurring revenue and 50% from the first payment. Their program is hosted by ShareASale which pay monthly through ACH or cheque when you reach $50 in earning. This is a suite of tools for bloggers to learn how to master affiliate marketing. Bloggers can start learning for free and upgrade if they want to learn more. It is a lot of included tools such as traffic analyzer, keyword research tools and more. Get 50% of any product your referred student buys. SinpLy is a marketing service that allows you to add a message to any link that you share on the internet. Imagine that you share someone else’s post and that link gets 1000 views. By example, you share a post from about.com. Normally, you get nothing. With SnipLy, you can add a message with a link to your site or product and get the traffic back. You earn 20% recurring referring a friend as an affiliate. They pay each month via PayPal when you reach $20 in earning. promote this product, get 50% on first payment and then 10% recurring. It is a conversion tracking and analytic tools. It can be used to track organic and ad campaigns. This tool allows you to measure your Return on Investment (R.O.I) a better way. Learn how you can enhance your analytics reports by including more data to track and import. Get 20% lifetime monthly affiliate commissions promoting PowerMyAnalytics. Start promoting now or start your 14 days trial free. Make money online working at home with freelance programs. Earn extra money by referring your friends. Get paid recurring payment. As long as your referred friends earn jobs, you earn money. Freelancer is the world most popular freelance marketplace. Get paid to complete hourly and fixed pricing jobs. Refer you friends and earn 10% from their jobs and projects for 90 days. Get paid weekly at $30 minimum Payment through Skrill, Payoneer, and wire. SeoClerks is a micro freelance marketplace where you get paid completing small tasks. Refer your friends and get paid lifetime 10% recurring income from your referred members revenue. Get paid through Western Union, PayPal and Payoneer. You can promote products with a free trial. So, when you refer the user, you earn nothing but users have time to test program, like it and purchase plans. Free services like freelance marketplace and money making programs convert better. Make passive money online with recurring affiliates programs. Like I said, it is not a complete list. So, I did not cover each niche where you can earn with residual income affiliate programs. These programs can be promoted in many niches, however. I strongly encourage you to test a program before you promote it. you’ll be more convincing promoting a product you know and love. I shared 5 quick tips to increase affiliate income on your blog. You can apply them. I love hearing about people who have found success with passive income online. It is definitely something that I’d like to try again in the future. Thanks! It is a nice way to earn money online Tarence! Thanks for reading! ;) wish you success in your next try! True that! Recurring affiliate networks are great for that ‘recurring’ revenue part. This is what makes them more desirable than the classic per action affiliate sales. You’ve not only listed the benefits of recurring income affiliate sales, but covered the topic in some detail, describing some awesome places and products to get started with. If you ask me, among the goodies mentioned in your list, I’d go with web hosting services. That’s because I’m used to selling them, especially Hostgator. I found the link to this post on Kingged. I’ll be Kingging it there too! If you take part in forums and write blog reviews, web hosting is a great niche to earn money with affiliates programs. They usually pay high commissions and pay up to $100 per sale! :) It is great! Thank you so much for compiling these great tips. Thanks! Thank you for the information, I was searching to try something genuine and really happy to see your post. Any ideas how to promote these links without a website? Hello, Shreekhar! You can promote these links using social media sites such as Twitter, Facebook, LinkedIn. But they are seen for a short time. For a long lasting impact, upload videos on YouTube, Slideshow on SlideShare and PDFs. You can add your signature on forums, but you have to keep posting to get seen naturally! I wish you happy residual income with these programs. I have referrals using GetResponse and Shopify. It is just good to make recurring revenue. Dreamhost offer recurring affiliate program? But why i didn’t notice it? I just view Dreamhost site on affiliate program but they dont mentioned about recurring commision? Or dreamhost had just change their affiliate program structure? They change their affiliate program structure, but not the way we’d want to. Dreamhost removes the recurring commission and the ability to set your own coupon code so you don’t use tracking links. I’ll remove it from the list. Great list of recurring affiliate programs. It’s great that we just need to refer a user once and enjoy lifetime commission. Btw, do you know any ecommerce store which have recurring affiliate program in niches like fashion, fitness, etc? I checked Seoclerks an they don´t have Western Union as a payment method. Can you tell me about any other site tat does?? Shopify is the best option for affiliate program. Residual income through affiliate commissions is a gift that keeps on giving. Of course, you will have to put in hard work and time but once you get the momentum going it will continue to prosper. Affiliate marketing is the best option to earn residual and passive income online. After reading your post I definitely go with affiliate marketing. Yeah! Definitely a good one for residual income. The affiliate programs already did the work with optimised landing pages.